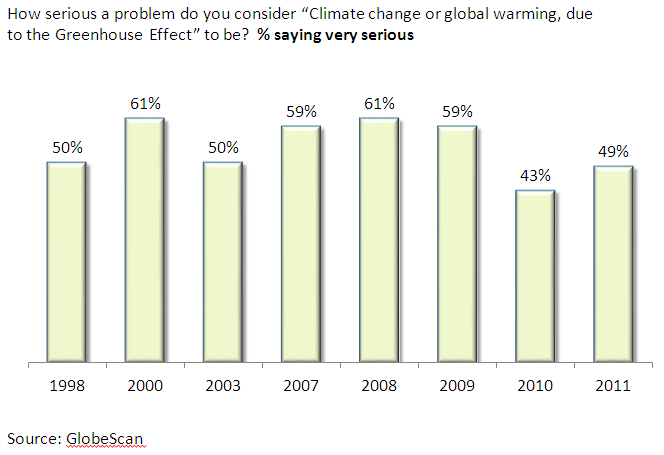 New data suggest that there has been a significant increase in UK concern about climate change. A Globescan tracking poll has been asking respondents globally how worried they are about various issues. Until now, only global-level data have been published, but the UK data are now available and show that the decline in concern about climate change seen in 2010 has partly been reversed in this year’s poll. While the climb in those who say that climate change is a very serious problem, from 43% to 49%, does not restore concern to the level of 2007-2009, it indicates that concern about climate change is not in steady decline. The findings also support other polling from 2011, reported here, which indicate that 2010 was an unusually low point in UK concern about climate change. This is particularly relevant for understanding the findings of the recent British Social Attitudes survey, which was conducted during that period. Sample size was 499 (making this year’s increase significant) and fieldwork was conducted between July-September. Why the dip and the (partial) recovery? I’ve never been convinced that the UEA email story was a direct cause of doubts about climate change because the fall in concern happened well after the news broke, and was also replicated in other countries where it wasn’t news. Previously I have suggested that the cold winter could have been to blame, but this is also hard to square with the international decline when global temperatures were unusually high around that time. The economy is the most obvious answer for the dip, but it can’t explain why there should now have been a recovery, unless there is some effect of the shock of the crisis wearing off and people starting to think about other things, for which I haven’t seen any evidence. One final possibility is that although the UEA emails might not have cut through to the public generally, they may have created an environment where global media have been more doubtful about climate change. This could then have filtered through to public attitudes, and so affected opinion. Perhaps that kind of coverage has begun to tail off and so its effect has reduced, though I haven’t seen evidence for this either. Whatever the reason, it’s clear that concern about climate change has climbed since last year’s low point. This should influence how older polls, like the British Social Attitudes survey, are interpreted, as well as undermining the view that steadily fewer people are worried about the issue. This entry was posted on Thursday, December 15th, 2011 at 19:31	and is filed under Climate Sock. You can follow any responses to this entry through the RSS 2.0 feed. Both comments and pings are currently closed.